Mentalix, Inc. announces the successful deployment of its latest biometric fingerprint product, Fed Submit, at the Carrollton, Texas, police department — effectively reducing the department’s turnaround time on criminal fingerprint records sent to the Texas Department of Public Safety (DPS) and the Federal Bureau of Investigation (FBI) from a few months to a matter of minutes. The Carrollton PD’s first electronic transaction resulted in a response within a few minutes of submission, making it one of the only stations in Texas with the means to send encrypted fingerprint records over the Internet to the DPS. 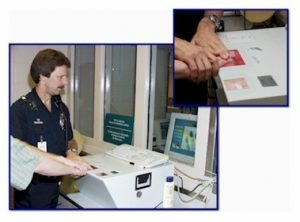 Fed Submit provides two affordable ways for the police to acquire electronic fingerprints: scan ten-print fingerprint cards with a flatbed scanner or roll live fingerprints with a live scan device. The software is one of the first solutions to allow the police to submit encrypted fingerprint records, along with associated subject biographical data and arrest information, to the Texas DPS electronically for identification comparisons against the state’s AFIS (Automated Fingerprint Identification System) database and to track the received responses. If a match is found, the results are sent back to the police department. If there is no “hit” on a record in the state AFIS, the DPS may then forward the record to the FBI for a check against the national IAFIS (Integrated Automated Fingerprint Identification System) database before the results are returned. “We’ve been looking forward to getting a live scan system, and it has been a big plus for us to be able to try out the system and have our people get familiar with it before buying,” Monty Stanley, Assistant Chief at the Carrollton PD, says. Previously, the Carrollton PD sent inked, ten-print cards to the Texas DPS by mail. This meant that results of the state’s AFIS comparison were usually not received until two to three months later. The Carrollton PD, in a Dallas suburb of 115,000, acts as a holding facility and usually transfers suspects 24 hours after they are apprehended. Because they did not receive confirmation of a suspect’s identity from the DPS within that time frame, the paperwork frequently had to be revised once the results arrived. By submitting its records with Fed Submit, the Carrollton PD now receives results much more quickly — as fast as within an hour of sending the initial transaction. An additional benefit of faster submission and response is that data-entry mistakes and fingerprint image issues can be resolved immediately, while it is still feasible to take the fingerprints again. Mentalix’s Fed Submit software detects image quality problems during acquisition and verifies certain data field requirements as the information is entered, so most errors can be handled prior to submission. In addition to offering the flexibility of using card scanning, live scanning or a combination of the two, the software runs on Windows® and works with off-the-shelf hardware; these factors make Fed Submit a cost-effective solution for police departments. The Carrollton PD found that buying a comparable system with both card and live scan functionality that can communicate with the Texas DPS, along with the required equipment, would have cost tens of thousands of dollars more than Mentalix’s solution.